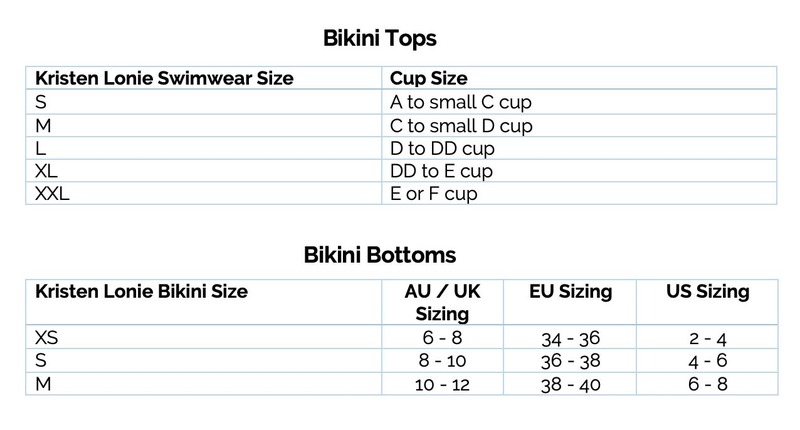 We gladly exchange should you choose the wrong size as we too want you to be in love with your new bikini. In order to do an exchange, you must first email [email protected] within 5 days of receiving your item notifying us of your exchange/return. The exchange must be made within 14 days from date of purchase. You will then be given instructions on how to return / exchange. ALL SALE ITEMS ARE FINAL, no refunds or exchanges. Kristen Lonie Swimwear offers store credit only for the item being returned for exchange. Postage excluded. No further coupon codes or discounts can be applied with an exchange. Kristen Lonie Swimwear are not mass made, some prints in particular are limited editions and cannot guarantee sizes will be available when exchanging. All items must have tags and liners in place. Due to health regulations, suits that are soiled, worn, damaged, or laundered will not be accepted. If your suit comes back with no liners or size tags cut off a credit note will not be given, you will be given the option to pay for return postage. The swimwear must be returned in a new, unworn & unmarked condition. The Customer is responsible for all shipping charges. Shipping and handling charges are non-refundable. We will process your return within 1-2 business days once received. Please send your order back registered post, Kristen Lonie Swimwear is not responsible or accountable for the loss of garments being returned. Kristen Lonie Swimwear are not liable for customs clearance fees in your country and holding times of packages by customs in your country. All Sale items & Customs Made Stage Wear orders are final, no return or exchange, no exceptions. Email [email protected] with your order number and wait for us to reply with instructions. Items will only be accepted if they are in a new, unworn condition with no marks. They must have tags and hygiene sticker attached to the pant. KL Swimwear reserves the right to refuse a return if its not in NEW condition. For hygiene reason we will not accept any returns that have been marked. Send back your return via registered post to ensure your parcel can be tracked and delivered to us. Please include your original invoice. Once we receive your return we will process your credit note within 1-2 business days. You will be emailed your Store Credit Coupon. PLEASE NOTE: The postage charge is not included in the credit & return postage is payable by the customer when reordering. What do I do if I receive my item faulty? All of our styles are handmade & finished to the highest level & are carefully inspected before being shipped to you. In the unlikely event that your garment is sent to you faulty or if you receive the wrong order please email us at [email protected] with photo evidence for us to determine what has gone wrong. We will promptly respond with further instructions.